The electronmagnetic spectrum is an array of light waves of different wavelengths. A wavelength is the distance between consecutive peaks of a wave. 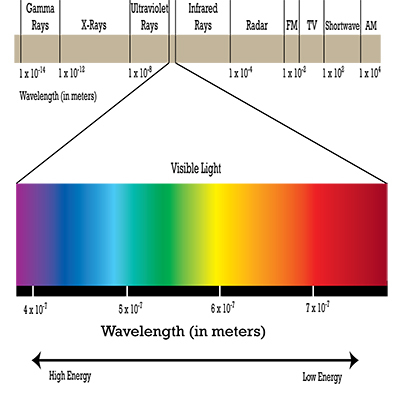 With our eyes, we can see a small portion of this spectrum, called the visible light. Visible light consists of light waves ranging from what our eye percieves as violet to bright red. Violet light has the shortest wavelegth in the visible light range. Red light has the longest wavelength. Waves shorter than violet waves are called ultra-violet. X-Rays have shorter wavelengths than ultra-violet. Our eyes cannot see them, but since light waves with shorter wavelengths carry more energy, they are more harmful to us. Light waves with longer wavelengths than red, are called infrared waves. Micro-waves are even longer. Radio waves are even longer still. Our eyes cannot see infrared waves, but our skin can feel them as heat. A heat lamp is nothing more than a bulb giving off a lot of infrared light. TV, radio, and cell phones receives information through radio waves.